In the same year he produced Alfred Hitchcock's Saboteur, Frank Lloyd (who twice won the Best Director Oscar) found himself supervising this tenuously connected response to the 1933 Claude Rains classic. Once again the emphasis is on flag-waving escapism, with Jon Hall inheriting the evaporating talents of grandfather Rains, this time behind enemy lines in an attempt to confound the Axis. 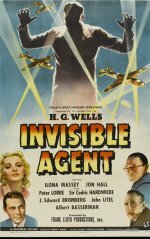 John P Fulton's Oscar-nominated special effects steal the show, but there are also some sterling supporting performances, notably from Peter Lorre (inverting his Moto impersonation to play a scheming Japanese spy) and J Edward Bromberg and Cedric Hardwicke as the Gestapo officers who terrorise Hall and his plucky accomplice, Ilona Massey.